South Africa hosts many airlines, both domestic and international, and is both a popular destination in its own right and a transit destination for some international routes. One of the most important factors in a long-haul multi-stage air journey is the standard of the stop-over destinations. People who have often traveled such journeys can probably tell you about grueling waits of many hours on hard metal airport chairs or even camping on the tiled floor with their luggage. Some airlines offer more comfortable lounges for their premier-class passengers, but then there is also the issue of efficiency in passport and baggage procedures. When a connecting flight has arrived late and there is not much or any spare time to board the next one, such hassles are far from minor. 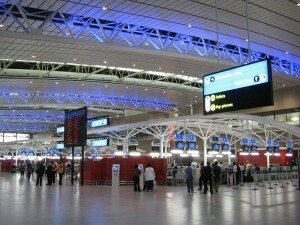 Airports in South Africa are operated by the Airports Company of South Africa (ACSA). However, while it is ACSA who maintains the infrastructure and premises, it is better to consult with your travel agent or airline about flight schedules and the progress of flights which have already started. South Africa generally maintains a good standard of service in its airports, since it is not one of the major international centers and it does not have the same level of traffic as the larger developed nations of the world. 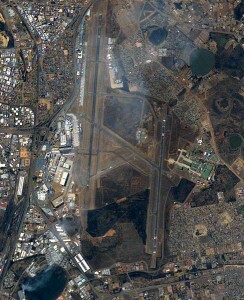 Aerial photo of OR Tambo International airport in Johannesburg. There are three international airports in South Africa – OR Tambo (Johannesburg), Cape Town International, and Durban International. The two most important are OR Tambo and Cape Town, and the main centre for flights is OR Tambo. Many flights depart from Cape Town but first stop in Johannesburg before leaving the country. If you are not flying direct from Cape Town to your overseas destination, you should be prepared for a wait of about an hour in the plane on the tarmac in Johannesburg. If you are making an international flight, it is advisable to be at the airport at least two hours before take-off. Check in as soon as possible. If you are concerned about rumored baggage theft in the airport in Johannesburg, you can have your luggage shrink-wrapped in plastic, although for domestic flights on the low-cost airlines this should not be necessary. One of the aprons at Cape Town International Airport. 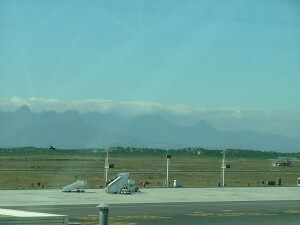 South Africa has seven other airports which handle domestic flights. Some of these airports do not receive many flights so if you want to fly to these destinations you will probably need to book well in advance and also pay a ticket price that is not proportional to the distance covered when compared to other domestic destinations. As with all domestic flights in South Africa, the flight shouldn’t last longer than two or three hours. The departure terminal in King Shaka International Airport in Durban.